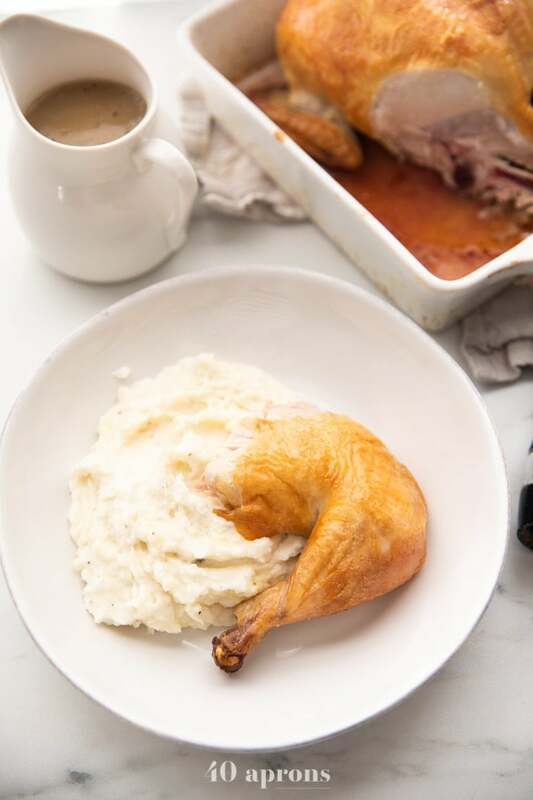 This simple and quick recipe for roast chicken is the best ever: crispy, beautifully browned skin, tender meat, and savory gravy. It’s crazy easy and perfect to have in your repertoire. With options for both a regular gravy and a Whole30, paleo, gluten-free gravy. There’s not much more comforting and homey to me than roasting a whole chicken in the oven. The rich, savory smells that fill the kitchen, the promise of crispy skin, tender meat, and gravy to pour over the whole thing? I just can’t get enough. 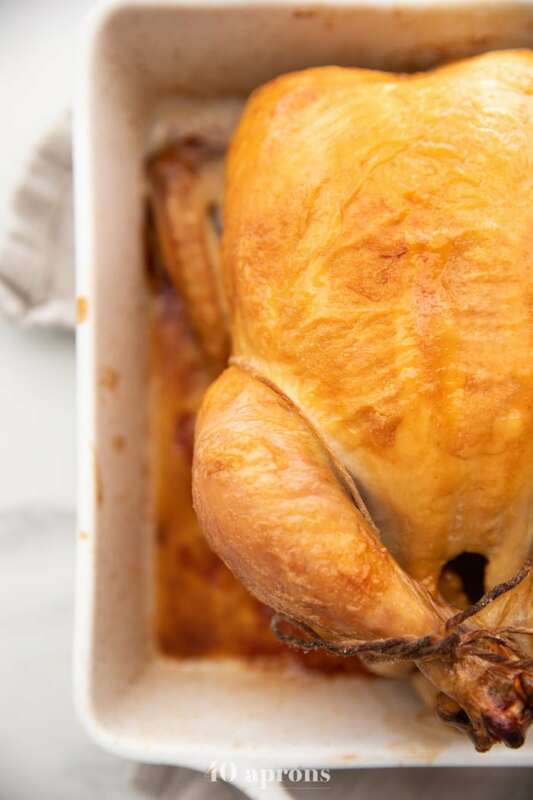 On top of that, roasting a chicken is an incredibly easy dinner to throw together any time you have a whole chicken on hand, and it’s the perfect way to end up with some cooked chicken for other recipes or lunches afterward. In fact, we tend to make a whole roast chicken each week! We eat the chicken as is the first night, then I strip the chicken of the cooked meat and save it for another recipe a day or two later. Finally, I use the bones in my Instant Pot bone broth recipe – talk about efficiency! This is absolutely the best roast chicken I’ve made at home, and it’s shockingly easy, too. It requires only a few steps and is done in under an hour. Did I mention it’s insanely easy, produces super crispy skin, and tender meat?! Obsession. So how do I make the best roast chicken? It’s actually super simple, but there is one thing you need to do to make it the best ever. Truss it! More on that below. Once you truss the chicken in your cast-iron skillet or roasting pan, you simply pour a good amount of a neutral oil with a high smoke point on top and cover it with salt. Pop it in the oven and roast for 50 minutes. Pull the best roast chicken out of the oven and transfer it to a cutting board, letting it rest for 5 minutes before carving. If you make gravy to go with your best ever roast chicken, now’s the time! After the gravy is made, simply carve the chicken and serve. Perfection! This best ever roast chicken is seriously so easy. After making it a couple times, you won’t even need a recipe, I promise! Trussing is a technique used to tie the legs and wings of a bird (typically chicken or turkey) to the body to ensure even cooking. Not only that, it prevents the cavity from being too open and wide, which allows too much hot air to circulate inside of it. 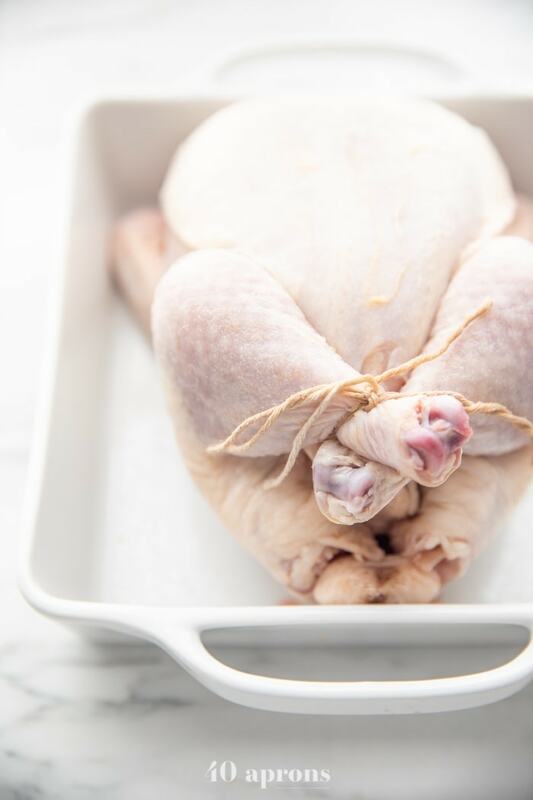 Trussing produces super moist chicken by creating a more even shape and preventing the air cavity from drying out the meat. It’s an absolute must-know technique for any home chef in my opinion. Cut a piece of kitchen string about 1 meter long, or about 3 feet. Place it centered in your cast iron skillet or roasting pan, about 2/3 from the top. Place your chicken centered on top. The string should hit right above where the top of the leg is on the chicken. Pull the string up, over, and down the legs. Cross the strings over each other then pull each side over and around the end of the legs, essentially crossing the legs over each other. The legs should be tied together tightly. Tie the string together at the top of the crossed legs in a bow. I take the wing tip and pull it up and back, pinning it behind the body of the turkey. Repeat with the other side. Your own arms will feel uncomfortable out of sympathy for the chicken, and that’s when you know it’s right. It’s super simple, though, really: simply push the wing tips back behind the body and tuck them there. Ronny from Primal Gourmet has a super helpful video showing his very similar method for trussing a chicken. Check it out if you need a visual by clicking here! How do you make chicken crispy in the oven? Luckily, this best ever easy roast chicken recipe uses all of those things to make beautifully crispy skin! How do you make tender chicken in the oven? Cooking your chicken at the right temperature simply means cooking it at a temperature high enough to crisp the skin and cook the chicken quickly, without cooking it at so high a temperature that the meat on the outside towards the skin would overcook. You want to make sure that you cook the chicken just to the right internal temperature and not over. Meat and poultry cook to temperature from the outside in; we’ve all seen chicken that’s not done down at the center when you cut into it! So cooking chicken to the right temperature means the meat towards the outside of the chicken towards the skin is already at the proper temperature before the meat by the bone can get there. So overcooking chicken at all means you’re really, really overcooking the meat towards the outside near the skin. Don’t do this! It can be hard to always find the exact right size of chicken to roast! But size is a super important element to roasting a chicken perfectly, as you need more or less time to roast to the right temperature. You can make sure you cook your chicken to the right temp every single time by using an internal thermometer. I have a fantastic internal thermometer that has a probe I insert in my chicken near a bone (the coldest part) when it’s in the oven. I set the desired temperature (161º F) on the digital display, and the thermometer beeps when it reaches that temperature. I take the chicken out and voila, absolute perfection every time! I highly recommend investing in a thermometer with a probe, since this makes cooking meat and poultry in the oven an absolute breeze. I like to use arrowroot powder in my recipes, since it’s relatively easy to find and seems to be a staple in most Whole30 kitchens. However, it does produce a fairly gelatinous look to what it thickens, this gravy included. While it will have a normal texture in taste, it might look a bit funny glopping about when you pour it! If you have cassava flour, I highly recommend using 3 tablespoons to make the gravy in this recipe, rather than arrowroot powder. Cassava flour can be a bit harder to find still, but it is the closest grain-free flour to all-purpose flour that I’ve found. I love, love, love the cassava flour from Thrive Market and highly recommend you taking advantage of their free 30-day trial to order some! You will fall in love. And then we’ll both be in love. With a flour! A grain-free flour of all things! How long does it take to roast a chicken in the oven? 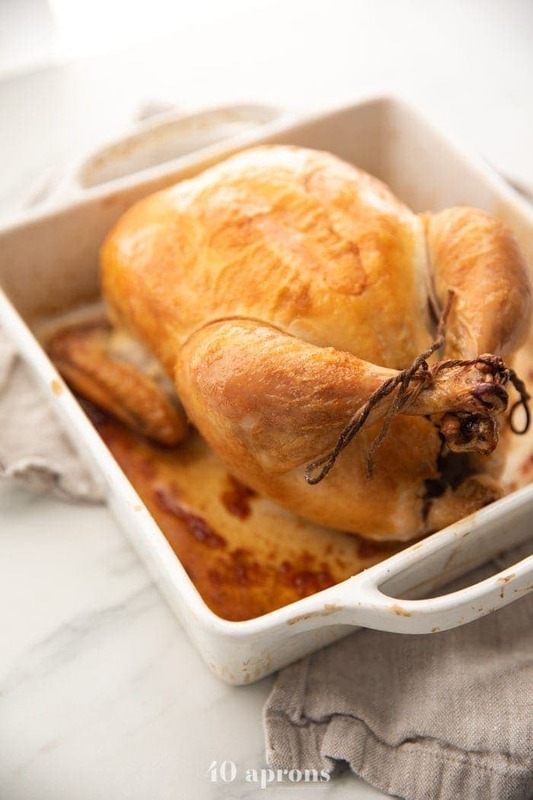 I cook this best ever easy roast chicken at 450º F, which allows the chicken to roast quickly and produce a beautiful, crispy, golden skin. It takes only 50 minutes to roast a 3-3.5 pound chicken at 450º Fahrenheit. I love that the whole thing is done in an hour! I recommend roasting your chicken in a cast iron skillet, as it for some reason produces a more golden brown skin, and it’s much easier to make your gravy in afterwards. I love that it’s super heavy duty and the perfect size for a roast chicken, too. Did I mention the gravy?! I prefer a 12-inch cast-iron skillet which I use daily for everything from breakfast to dinner! 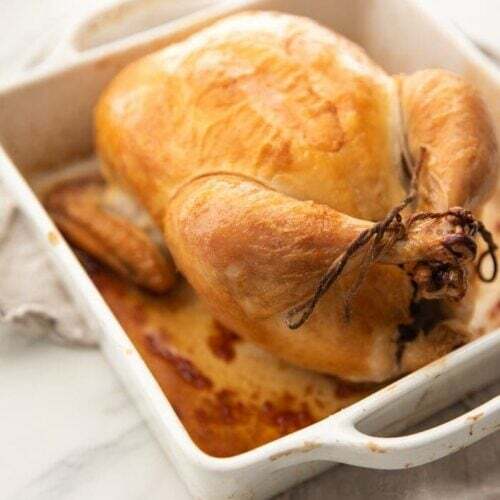 The best roast chicken recipe with crispy skin, tender meat, and a delicious, savory gravy. It's quick and easy, the recipe every cook needs in their arsenal. Preheat oven to 450º F, 232º C.
Place a piece of kitchen twine about 1 meter long centered in your cast-iron skillet. Place the chicken on top, breast up, and bring the twine up and over the legs, down along the crease where the leg meets the body. Run twine under ends of legs and then pull twine to meet, crossing legs and pulling very tight. Tie a knot and finish with a bow. Take wing tips and pull them up and behind the body of the chicken, tucking behind the body. Pour oil over the chicken and sprinkle liberally with lots of salt. Place chicken in oven and roast for 50 minutes, or until internal temperature is 161º F. It will take slightly longer for bigger chickens, which is why I highly recommend a digital thermometer with an internal probe. When internal temperature reaches 161º F, remove from oven and carefully transfer chicken to cutting board to rest. If you're on a Whole30 or are paleo, gluten-free, or grain-free, use the ingredients under the "Whole30/Paleo Gravy" heading. Otherwise, use the ingredients under the "Gravy" heading. Carefully place cast-iron skillet on stovetop, making sure to always use a pot holder to touch the handle from this point on. Pour of all but 3 tablespoons drippings then sprinkle flour, cassava flour, or arrowroot powder over. Whisk constantly until smooth and golden brown, then gradually pour in chicken stock, whisking constantly until incorporated. Season with salt and thyme or sage. Simmer until slightly thickened, a few minutes. If you have cassava flour, I highly recommend using it instead of arrowroot flour. Use 3 tablespoons cassava flour, not 4 tablespoons. Cassava flour is paleo and Whole30-friendly. If you have no particular dietary restrictions, you can use 3 tablespoons flour instead. 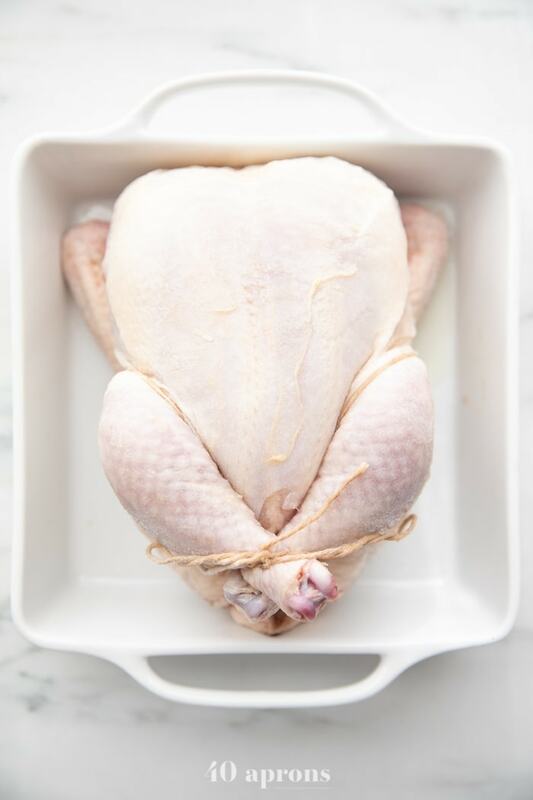 For help with trussing your chicken, click here to watch a super helpful video. 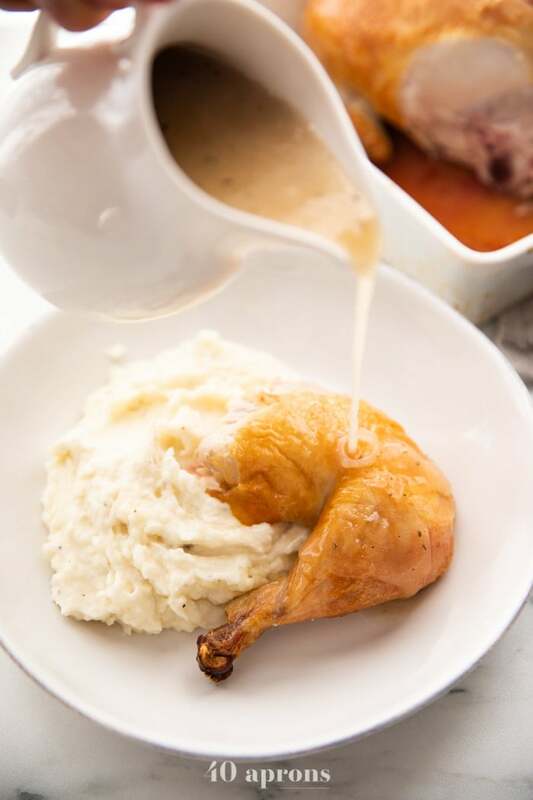 Try this recipe if you need your gravy to be low carb or keto. 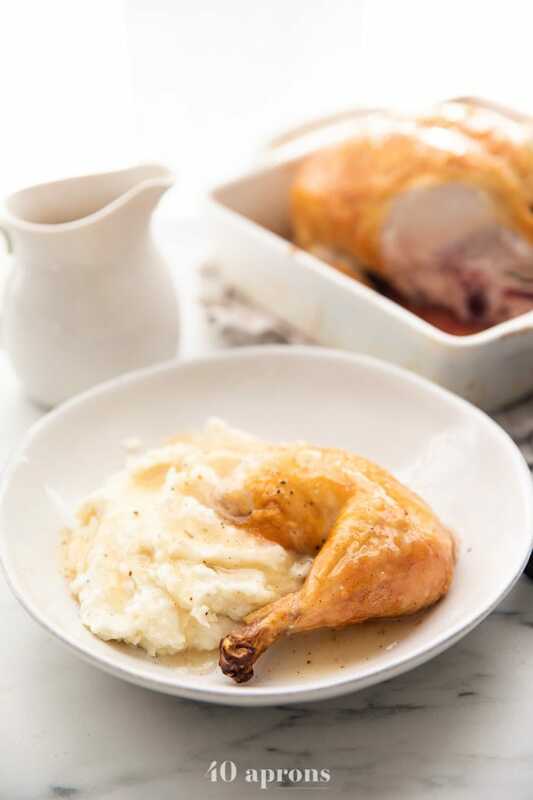 This does look the best roast chicken ever, and with those mashed potatoes and gravy, well… I’m going to need this right away! Great instructions. Sounds delicious. Pinned to try this one soon! Thanks for the link to the ‘visual trussing. That was very helpful– as good as your instructions are.. I ‘got’ it with the video. I have a cast iron skillet (inherited from my mom) and don’t use it often enough! Will get busy and get organized and make this!! It wouldn’t be the same without the gravy! This chicken look so delicious! This looks seriously delicious, and the paleo option is great! This looks SO GOOD!! And with a paleo option I know so many people who will love this! Great info about the importance of trussing in here. I learned a lot and can’t wait to try your recipe! Wow, so many great tips; thank you! I love how simple your chicken photos are: just beautiful golden chicken, super impressive! I’m so excited to try this recipe and this gravy. I’ve never roasted a chicken in a cast iron skillet, what a great idea! Love simple roasted chicken. Ultimate comfort food for every day! I love a good roast chicken and this looks so flavorful and juicy! Can’t wait to try it. This looks so good I almost smell it through the screen! I love easy chicken recipes! This was the absolute best roast chicken I have ever made. Easy and delicious. I like the idea of making a chicken once a week too. Another habit I will incorporate. I made it with boiled Yukon gold potatoes (small ones cut in half) that I then “grilled” in a cast iron pan with a layer of salt , oil and garlic til they were brown and crunchy on one side. I tried the gravy using arrowroot powder but the consistency was strange ( I’m a nurse so I’ll call it mucousy) . It was gelatinous I guess. Also I added a bit more oil to the chicken about 15 minutes before it was done. It could have been a bit more brown and crispy. I’ll have to check my oven temp might be off. I’m laughing at mucousy! That is definitely how arrowroot powder behaves. I find that it LOOKS and sort of acts odd but tastes pretty normal 🙂 If you have cassava flour on hand, I highly recommend that in place of the arrowroot for gravy but it’s a bit hard to find, so I keep arrowroot powder in there for Whole30-ers 😉 If you found the skin wasn’t as crispy as you’d like, you may want to move the chicken closer to the heat source or potentially broil the chicken instead of baking for the last 5 minutes. Thank you for making this!! I’m so happy you liked it! There is nothing better than a perfectly roasted chicken. You nailed it! That chicken looks absolutely perfect! Definitely an art to the perfect roast chicken…want to get cozy with a plate of this on my lap and that smell wafting through the air! I seriously love nothing more than the smell of a chicken roasting in the oven! Such promise – ha!